A Consultant Obstetrician and Gynaecologist, Dr Khin Win Kyu has been volunteering much of her time for the last 17 years at the Muslim Free Hospital in Yangon, a hospital that treats poorer communities without charge, regardless of race, religion or ethnicity. Established in the 1930s, the hospital is a microcosm of what an ideal Myanmar society could be like, where people from all faiths work together to treat the less fortunate, irrespective of their religion, ethnicity or race. Dr Khin Win Kyu previously worked in the government service for 22 years. 1. 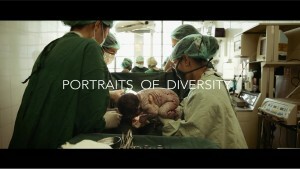 How does the Muslim Free Hospital where Dr. Khin works promote diversity and peace? 2. Dr. Khin says that “the hospital functions mainly because of different faiths working together.” Why do you think this is so? How can this be applied in other settings/contexts? 3. How does she react to anti-Muslim violence in Myanmar? What does she believe causes people to carry out this violence? Do you agree? 4. What does Dr. Khin do or say that shows hope and a vision for a peaceful future? 5. What do you see and hear Dr. Khin doing that counters the misconceptions she says some people have that Muslims are extremist or aggressive? 6. What can be done to gain more knowledge about different faiths? Make a list of the ways providing care for mothers can positively effect in your own community. In partner or small groups, share your lists, and draw out common ideas, and discuss how this can apply to other communities. Be sure to question and explore any difference that might be unique to the communities of the group.